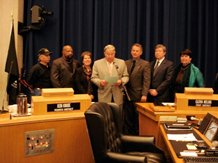 Los Angeles County Board of Supervisor Don Knabe conferred a scroll of recognition on Tuesday to Bonnie Quintanilla and Phyllis Grabot, principals of Corridor Communications, Inc. The scroll honors their contributions to Veterans and the community and marks the imminent arrival of the Dignity® Memorial Vietnam Wall March 21, 2010, and celebration of California’s first Welcome Home Vietnam Veterans Day. The Dignity Memorial Vietnam Wall is a traveling, three-quarter-scale replica of the Vietnam Veterans Memorial in Washington, D.C. The memorial is dedicated to Vietnam veterans and honors all service men and women of the U.S. military forces. The traveling memorial was created as a service to those who might never travel to the nation’s capital to experience the Wall firsthand. The 240-foot long, eight-foot high, faux-granite replica contains the names of more than 58,000 Americans who died or are missing in Vietnam.